This article is about the young Clark Kent, "Superman when he was a boy." 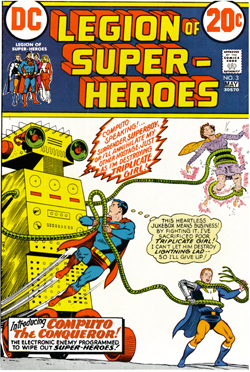 The term "Superboy" can also refer to "the kid," a genetic construct of "The Project;" and to Bill Aronis, the real-world winner of the 1940 World's Fair Superboy Contest. 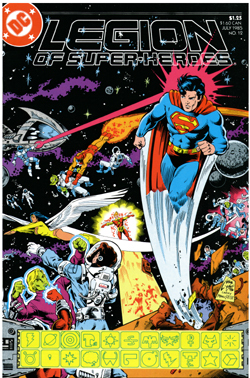 Rocketed from the exploding planet Krypton by his scientist father during the middle of the 20th century, the infant Kal-El's spaceship landed outside Smallville, USA (future site of the first Legion headquarters). He was found by Jonathan and Martha Kent, who adopted him soon afterward, naming him "Clark." By his teenage years, using his Kryptonian powers, Kal had adopted a career as the costumed hero Superboy, carving a legend so remarkable that it endured 1000 years and served as the very inspiration for the Legion of Super-heroes. Once the Legionnaires had mastered time travel, they went to Superboy's time and invited him to join their team. He did so, and Superboy continued to travel to the 30th century to participate in Legion adventures so frequently that Saturn Girl even created in him a post-hypnotic suggestion that made him forget any details of his future life that he might ascertain during his stays. Though a native of another time, Superboy is nevertheless the most loved and respected Legionnaire and was instrumental in the careers of both Mon-El and Ultra Boy. Text on this page taken from DC's Who's Who in the Legion of Super-heroes mini-series, circa 1988.